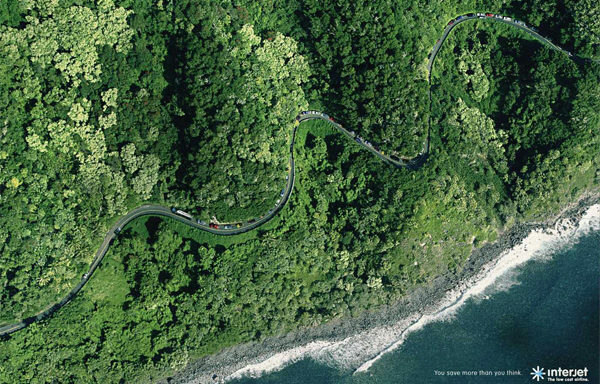 Did you know that Mexico’s filled with curved roads? That’s why it’s better to fly by plane. Interjet offers low-cost tickets that allows passengers to do just that. Featured here is the house of a passenger of the airline that has just returned from his trip. 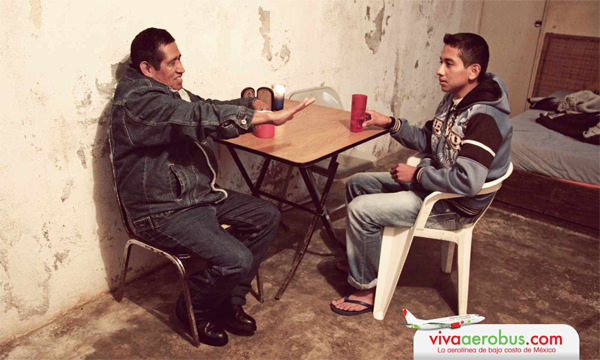 No matter the financial situation, with Mexico’s low-cost airline, they can buy a plane ticket anywhere. With airplanes, the globe is now smaller. 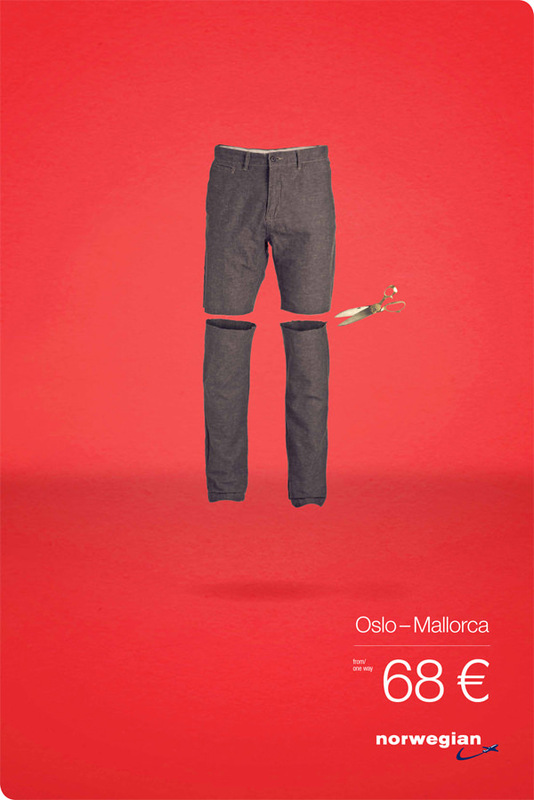 You can fly from a cold region to a hot one in no time faster than switching your wardrobe! 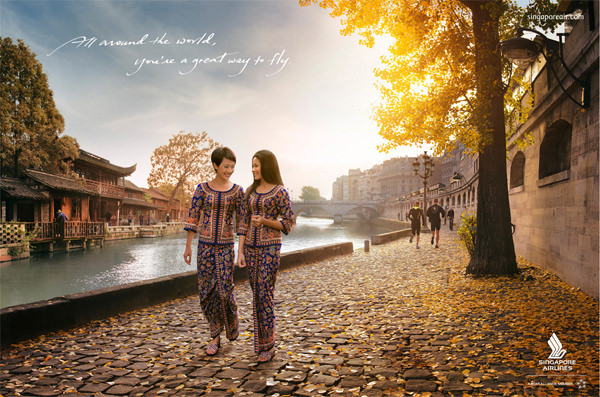 No longer focusing on their iconic ‘Singapore Girl’ Singapore Airline’s latest campaign is a step towards a more contemporary feel. The airline wants to give off a feeling that their customers needs are being looked after. Travelers are big kids at heart; the world is their playground. 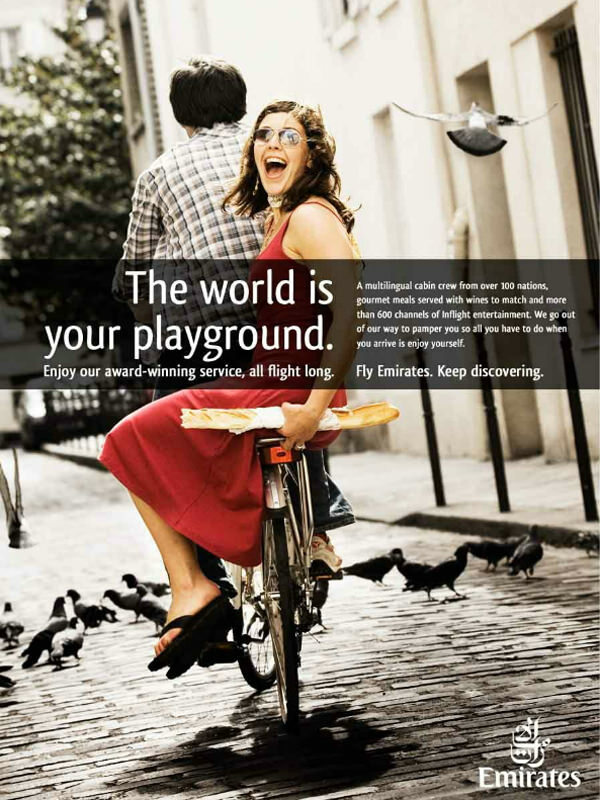 Why not let Emirates look after you while you get there? Romance is in the air. 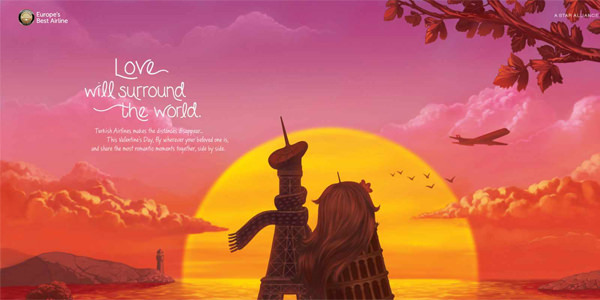 With Turkish Airlines, you can fly to your loved one, wherever they may be, and spend Valentine’s day together. Whether it’s the customers or their own internal staff, American Airlines has always embraced the African American culture. 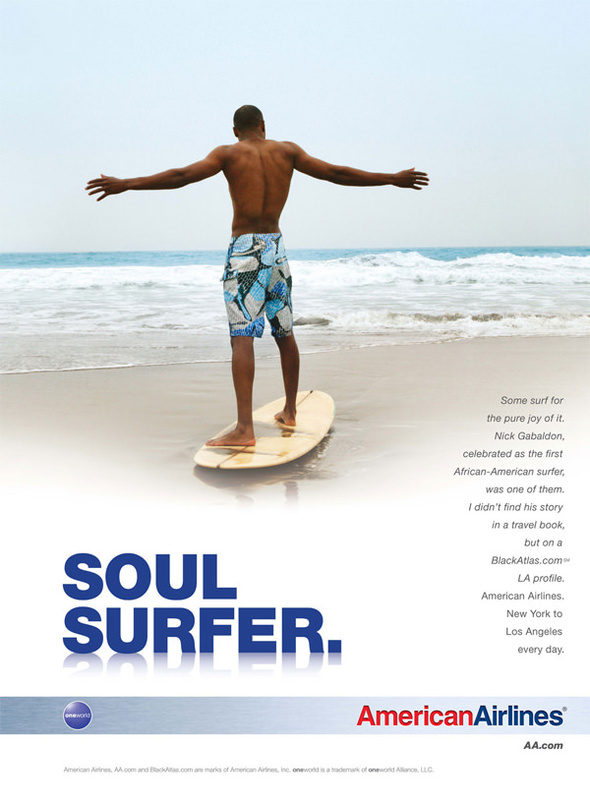 This series of ads is dedicated to African Americans that supports their businesses worldwide. As a kid, we’ve all had the dream of flying. This ad tugs on your heart strings, bringing back those memories as well as the realization that planes can now make our dreams come true. 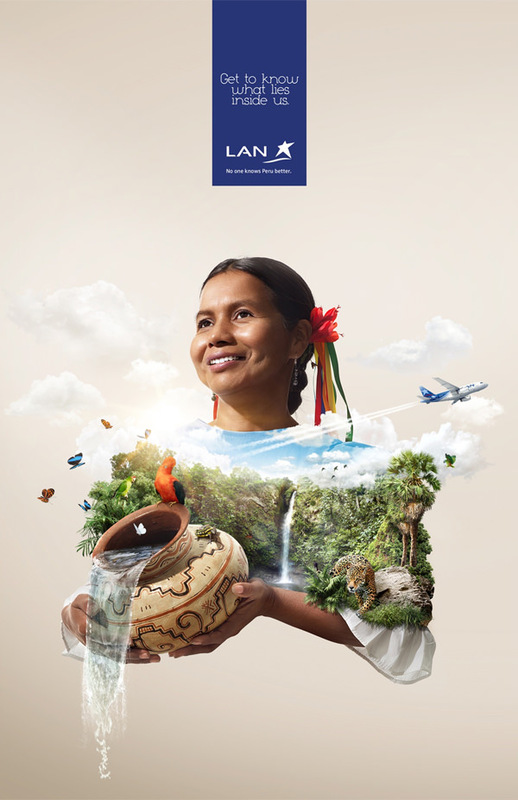 The airline uses storytelling and the curious minds of travelers to attract them to visit particular places. 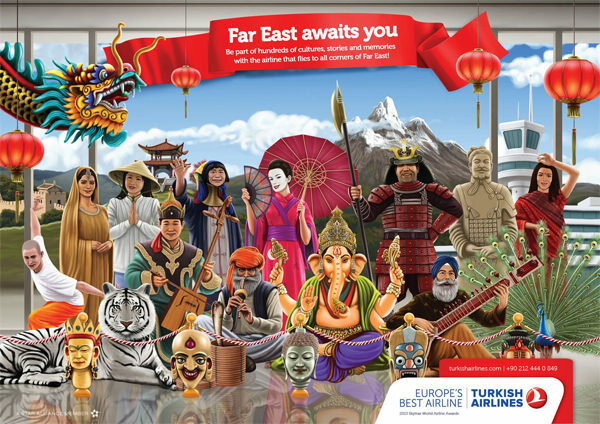 In this series of ads, Europe, Far East, Africa, and America are highlighted. 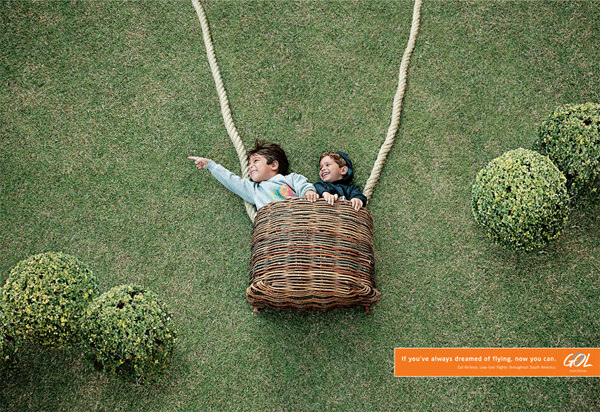 This print ad uses a more symbolic approach to show us what good lies within people, as well as the airline. The world is a peaceful and beautiful place, go see it! 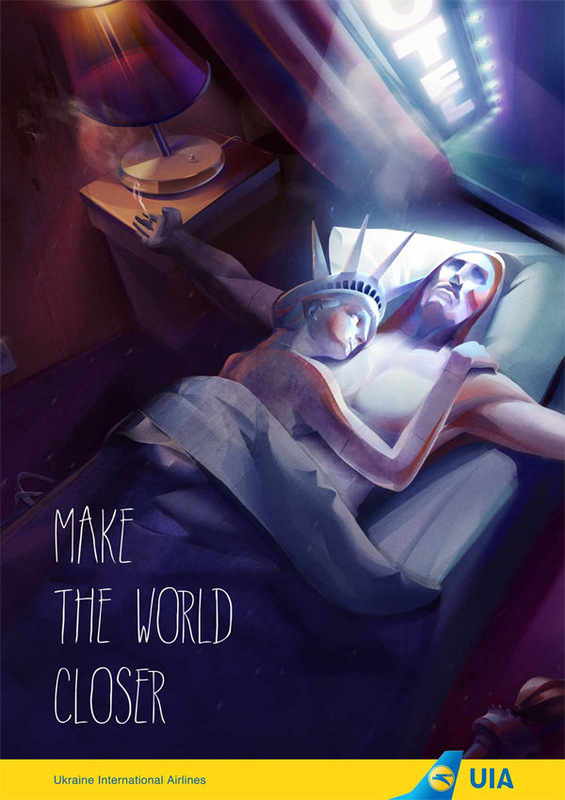 This Ukrainian ad depicts the sculpture of Jesus from Rio de Janeiro and the sculpture of Lady Liberty from New York. The world is closer than you can imagine. 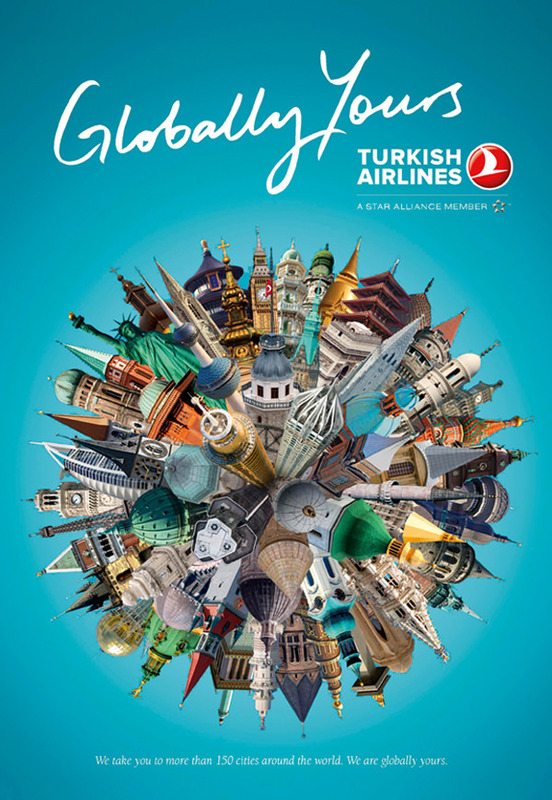 Here Turkish Airlines uses recognizable icons from some of their 150 or so destinations around the globe — highlighting how easy it is to get from one to the other. 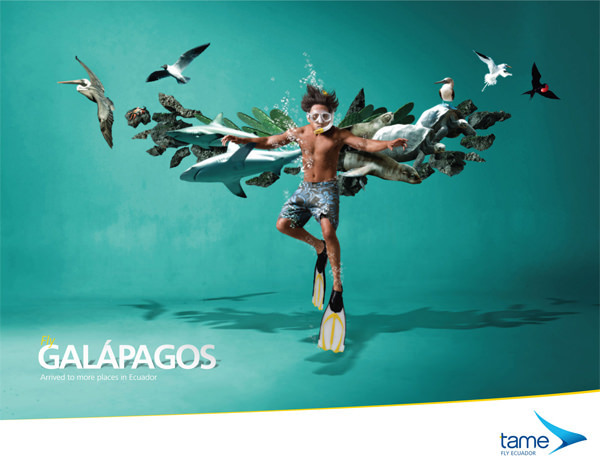 Spread your wings with Tame Ecuador Airlines. Wherever it is you want to go to, you can do it with ease. 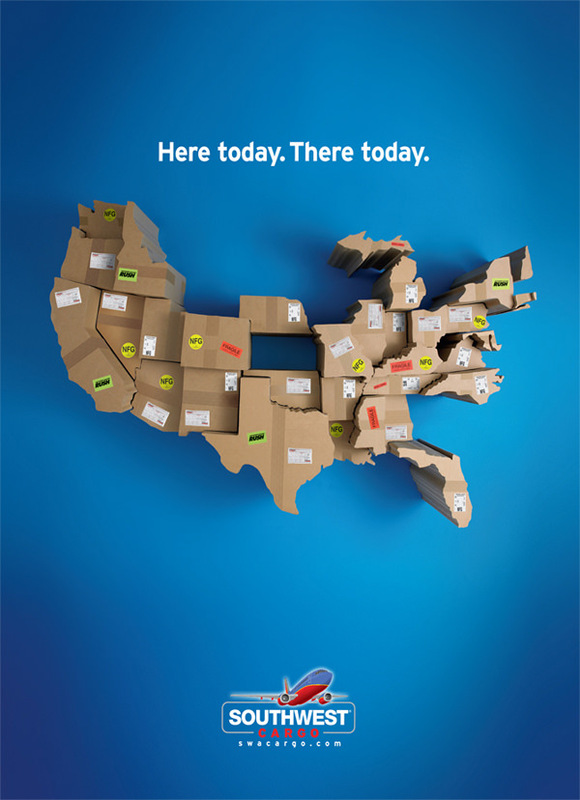 The Southwest Cargo Ad below works on a simple visual level to convey the message that your package can be delivered within a day. 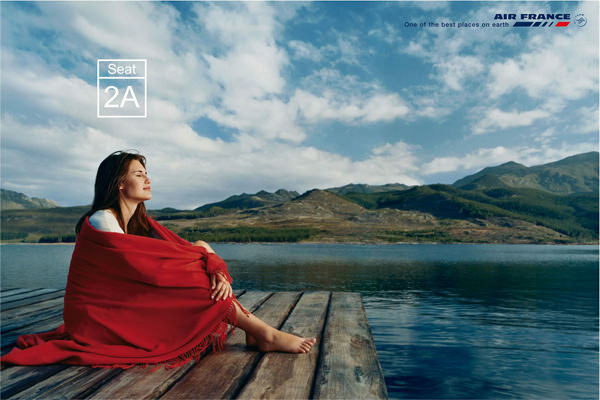 The importance of the visual can also be seen in their regular airline ad. 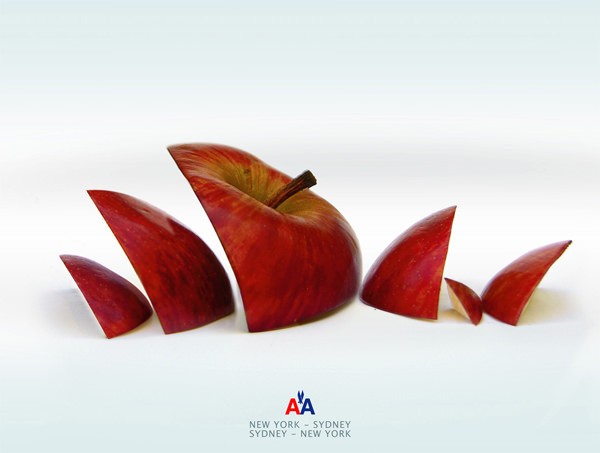 This ad cleverly uses a ‘Big Apple’, which is known as a New York symbol, to form Sydney’s opera house. The ad shows that you can fly from New York to Sydney and back in no time. An ad tailored particularly for Christmas. Brazil airlines will deliver your holidays to you, whether in presents or flight. Not everyone is where they want to be sometimes. 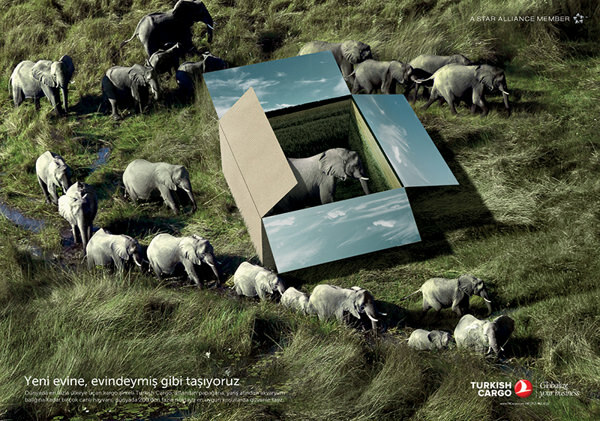 Turkish Cargo helps you move to a new home. The connection between the airplane seat number is subtly linked to getting you to your ultimate destination. Air France can take you to the best place on the earth if you fly with them. South African Airways experts here are animals such as flamingos, hippos and ostriches. Using humour, this ad shows that these experts know which airline to fly with, in comfort. 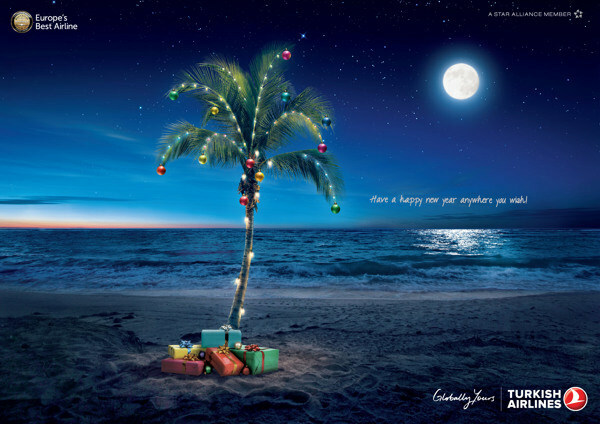 Why not spend Christmas somewhere tropical? 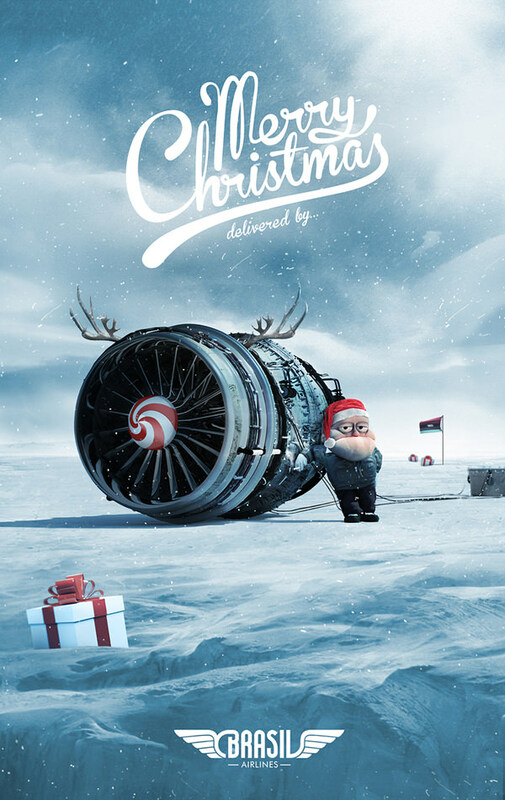 Thanks to Turkish Airlines you can now spend your Christmas holidays anywhere you want.